How do make sure we provide the support that EACH school needs so that EVERY Student Thrives? How are our schools doing? Are students thriving academically? Are students thriving socio-emotionally, and are they in a strong school culture and climate? 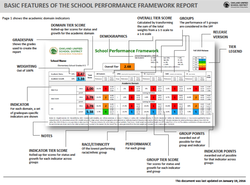 OUSD is launching its School Performance Framework in Fall 2016. This is a School Performance Report that will support the District and school communities to identify their strengths and areas for growth. ​"Big kudos for the SPF, I'm a big fan. Great to have all that data in once place, makes my job easier." How can we engage our community? ​Click HERE to learn more at ousd.org.